Named for their habit of living on, in and near the homes of people, Mediterranean house geckos are common inhabitants of many anthropogenically altered habitats. Hiding under shingles and shutters, growing heavy eating the many flying insects drawn to nearby porch lights and street lamps, house geckos thrive living directly adjacent to humans. As you may expect, many lizards who live in close association with humans, adapt very well to captivity and make great pets. A glass aquarium fitted with screened lid makes a good habitat for your Mediterranean house gecko (Hemidactylus turcicus). Though house geckos are relatively small lizards that reach only about 5 inches in length, they require spacious cages. A 10-gallon aquarium is acceptable, but a 20-gallon “tall” aquarium will provide your gecko with more space. With a large enough cage, you can keep house geckos in small groups; you can keep one male with several females, but males may be antagonistic to one another and should not be housed together. Mediterranean house geckos prefer rather warm temperatures, but it is important to provide your gecko with a thermal gradient so the creature can move between warm and cool areas to maintain an appropriate body temperature. Facilitate him by placing a heat lamp fitted with an incandescent bulb at one end of the cage. Use an infrared thermometer to check the surface temperatures in the cage; the temperatures right under the heat lamp should be in the mid-90s and should drop to the low 80s at the cool end of the cage. Being nocturnal, house geckos do not require full-spectrum lighting. The lights should be on for approximately 12 hours per day, turned off at night. 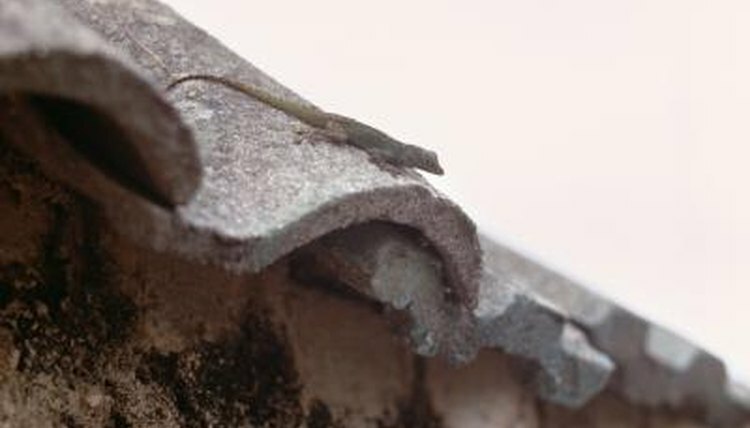 Several substrates will work for house gecko maintenance. Simple and low maintenance options include paper towels and newspaper, which work well but lack aesthetic appeal. Alternatively, you can use organic potting soil, cypress mulch, orchid bark or leaf litter if you want a more natural look. Change paper substrates two to three times per week; for particulate substrates, perform a daily spot cleaning and periodically replace all of the substrate. Include several live or artificial plants and branches to give your gecko places to hide and climb. Mediterranean house geckos are primarily insectivorous; they will thrive on a diet of crickets, mealworms, waxworms, silkworms and roaches. Provide your gecko with five to six weekly feedings, each consisting of several insects. Do not allow uneaten crickets to roam the enclosure, as they may chew on your gecko’s skin. Offer insects no longer than your gecko’s head is wide. Once or twice per week, dust the feeder insects with a vitamin and mineral supplement before feeding them to your gecko. Mist your gecko’s enclosure once per day to elevate the cage humidity and provide your gecko with droplets of water to drink. Though most house geckos will not drink from a water dish, it is a good idea to include one anyway. Herpetological Conservation and Biology; Status and Geographic Expansion of the Mediterranean Gecko, Hemidactylus Turcicus, in Louisiana: Implications for the Southeastern United States; Walter E. Meshaka Jr. et al.